EVENT STAFF EMAIL NOTIFICATION: The staff notification that goes out when someone is registered, now contains both payment method information (i.e. credit card or invoice) and session information (if it contains that). SPONSORS: We have made the sponsor images that show on the bottom of the event registration page larger now. The max width on those images is now 200px. This will hopefully make the logos easier to read. IMAGE MANAGER: In the back office, there were a few places that the ability to upload an existing image was not available. We have now made sure that you are able to upload existing images from Email Templates, Email Communications, and Web Content. See example. PAYMENT RECEIPT: We now send an email receipt to a user after they make a payment in the Info Hub. You will find this email template located under Setup> Email Templates, and it is called "Member Invoice Payment Received". You then will need to set that email template in Automated Messaging for the "Invoice Payment Received" option. See example email. MERGE FIELD: Currently, the <<BillToAddress>> merge field in the Invoice Template Document puts both Address Line 1 and Address Line 2 on the same line on the invoice. There has been a request to have the address lines separated out to two lines. The new merge fields that can be manually placed in the invoice and statement templates are <<BillToAddress1>> and <<BillToAddress2>>. The original <<BillToAddress>> will still work as is and will remain the default in the invoice and statement templates. MEMBERSHIP REPORT: In the Membership Report, you will now see a Start Month filter option at the top. See where this is. USER ACCOUNT REPORT: In the new User Account report, you are now able to filter on Membership Status. EVENT ATTENDEE REPORT: Event Attendee Report, now has Registration ID available as a field to display. This now gives you the ability to compare reports and data on a unique identifier. In this report, you can now also use the "Add to List" option, under the dropdown of the Run Report button. More updates are in the works for this report! EVENT ACTIVITY REPORT: On the Event Activity Report, we have added "Primary Business" to the fields to display, so that customers are able to pull in the organization name. RENEWAL MEMBERSHIP REPORT: This report now has a "membership type" filter field. AUTHORIZE.NET – Authorize.net customers now have the ability to save credit card profiles to the organization. Previously the credit card could only be stored with the individual who added it. Now, when adding a credit card via the hub, the end user will see two options shown here. Here, the member can now, not only see what their listing will look like/what info is displayed, but they can easily edit all the fields inline rather than having to click on a pencil icon. See screenshot of what this looks like. You'll also see in this newly updated screen that you control which listing you are editing with the dropdown at the top. See which dropdown. Now, when you click on a member in the directory from within the Info Hub, the directory listing's details page that you are brought to is easier to read and has a more logical order to the items listed out! Less heavy table use and a more clean design. See a screenshot of an example business directory listing. INFO HUB LINKS: We've now created a way that association staff members can generate a link to send members directly to a specific page within the Info Hub (referred to in the wiki as a "static link"). An example use case could be - If a staff member is sending out a newsletter and wants to be able to include a link to where members can pay their open balances. They can now do this! Once a member clicks on that link, they will be brought to the login page, then to the intended page. To create a static URL, you must replace the contact id and the organization id that is in your Info Hub URL, with the word "static". Here are instructions on how to do this in the support wiki. MANUALLY SET PASSWORDS: Now, when a user logs into the Info Hub with a password that is manually set in the back office, the user is immediately presented with the change username/password screen. Before it didn't prompt you to change your password. So now, the manually set passwords are truly temporary. MEMBER APPLICATION - HUB ACCESS: We have made improvements to the checkbox in Membership Application setup screen, that allows you to send users to the Hub after completing the membership application. Now, when the checkbox is enabled, a user is brought to the Account Creation screen. See a screenshot of where this checkbox is. CUSTOM FIELDS: When adding a custom field to your membership application, you can now add existing custom fields of the types: Individual, Organization, and/or Membership. Meaning, when selecting Individual or Organization type fields to be on your membership application (through your membership policy), those will also then be shown on the More Info tab of the individual or organization's profile. Membership type custom fields will still only be shown on the membership app and then within the membership details area of the individual/organization. MERGING CONTACTS – Login issues have been caused by merging contacts. New logic has been added to prevent issues that were happening when merging contacts. When two contacts both have a login, the destination contact’s login will be preserved, and the other login will no longer be active. If only one contact has a login, that login will be preserved regardless of which contact was the destination. DROPPING MEMBERSHIPS – Additional logic has been added to address login issues when memberships are manually dropped. Most notably, when dropping a membership the system now automatically changes the access level to default set the most restrictive type available for users. This changes just the dropdown that is presented on that screen and does not happen in the background. This gives staff the chance to review the proposed change and reset it to whatever they want. If the user still has an active membership of the same type, no changes are made automatically to prevent the user from being inadvertently restricted. If the user has an active membership of another type (e.g. they're dropping their individual membership but they still have an active membership with their organization), the access level with the active membership remains unchanged so the user keeps the correct level of access. IMPERSONATING CONTACTS – When impersonating an account without a login, the system will now apply the default level of access to prevent the confusion being caused by the system using “admin” permissions to perform the impersonation functions. DISABLE/ENABLE USERS: When you are accessing a user’s login information from their profile (Contact> Purple Actions button> User Login), you will now see a "disable" button next to the delete button. This allows Staff members to easily turn off a users access to the Info Hub. Once disabled, the button then turns into an "enable" button, making it easy to re-enabled the user. If you delete a user's access, this deletes the account they've created for the Info Hub, and allows that username to be used again, if need be. The new User Account report now has a status filter that allows you to see which have been deleted, disabled, etc. CLEANER LOOK: When adding a new question to a form, the dialog screen is much easier to navigate and understand. Use Existing Field and Create New are now broken up into two different sections. See what this looks like. PAGES & SECTIONS: You can now set up a form with multiple pages and/or multiple sections to design more complex forms. To add pages to a form, you just need to specify which page number your question should be on. See where this is. This will automatically create the page effect when a user goes through your form. So for example, all questions that you mark with page #2 will be on the second page. When users go through the survey, they will click "next" to continue through each page you've added. To add a section, use the "Manage Sections" button above the list of your questions (see where this is), create the desired section headers, and then on each question select the section that applies (see where this is). NOTE: Sections are independent of pages, so (if needed) you can reuse sections on multiple pages. SCALE TYPE QUESTION: Now, when creating a scale type question, a section automatically pops up allowing you to set the scale value (ex. 1 to 10) right on the fly. See what this looks like. 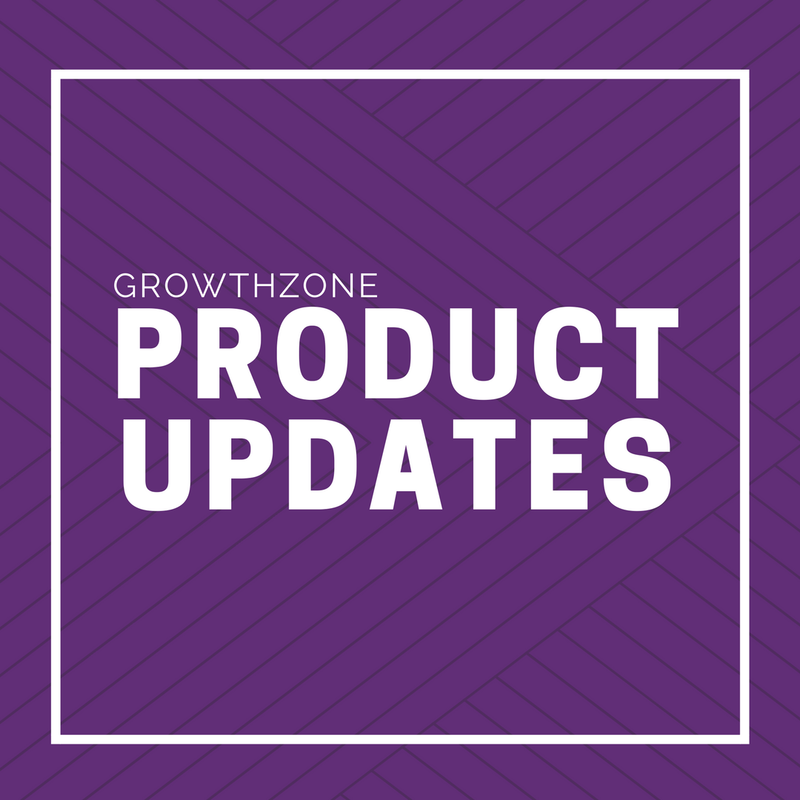 If a user unsubscribes from a list in Constant Contact/MailChimp, the Do Not Contact is also set for the contact on that list in GrowthZone. On any of the four Add/Edit List screens, if "disallow opt out" is selected, "sync with 3rd party" is grayed out and vice versa. This is because these marketing tools, by law, have to allow the user to select their subscription preferences.